SEO is SUCH a hot button topic right now. Everyone is talking about it, trying to figure out what it is, what it means, how to do it and what it is for. We know it's important, we feel like we need it but we aren't quite sure exactly how to go about getting it. Since I'm a Squarespace-aholic, this post will be centered on strategies for SEO on your Squarespace site, HOWEVER, the most important thing to note is that SEO is an ongoing process. It is NOT a one stop shop where you can just buy some good SEO and be done with it. In order for them to accomplish this, they need good info to start with. The more successful you are at making their mission easier, the higher you will rank. It takes work. It takes time. It takes patience. But with some good strategies in place, you can certainly make strides when it comes to your placement in search results. It's probably helpful to understand what this thing IS that we all seem to want right? In basic everyday terms, it’s how your website performs (optimization) in consideration of what google (or other search engines) is looking for in order to pull up relevant and helpful information whenever someone types something into the search bar. If you want people to be able to find you on the internet through relevant search terms, SEO is pretty darn important. If you are a private photo editor for wedding photographers and you want your website to appear on page 1 or 2 of google's search results when someone types in "private photo editor" then SEO is of MUCH importance to you. In this day and age, being "found" on the internet is TOUGH. There is a lot of noise out there and millions upon millions of websites and info floating around on the world wide web. When it comes down to it, you may have to realize that depending on the keywords or search terms that people may use to find you, you may never end up on page 1 of search results and that's OK! There are lots of other ways to build a sustainable, profitable business without being on page 1. But it never hurts to make sure you are doing the right things on your site as soon as possible in order to increase your chances of being found by someone looking for exactly what you do! Well if that isn't the million dollar question then I don't know what is! SEO is an ever evolving subject and it's really, REALLY difficult to nail down exactly how it all works. However, you can make a lot of progress by paying attention to some key things: accessibility, quality content, links to your site. Can search engines effectively crawl your site? They do this through sitemaps. With Squarespace you don't have to manually add a sitemap, they create it for you. You do want to make sure you add your sitemap to Google and Bing Webmaster Tools. You need to sign in or create an account and then add your site and sitemap. Here is a great step by step video on exactly how to do this! This is the meat. And is absolutely the hardest to chew. Content is king. Fo' real. There is so much packed into those words that it kind of almost makes my head hurt trying to explain just how important this aspect is to your websites SEO. Unless you somehow are featured on tons of other websites (and popular, high traffic websites...see below) content is going to be your absolute best friend when it comes to SEO. And where does content live on most websites? I'll give you a clue...it's not in your image galleries. Quality content lives and breathes in your BLOG. This is why so many people tout the benefits of blogging, especially to small business owners. Having a place on your website where quality content that is useful in search engine results lives is of the utmost importance. "Cinnamon Wolfe Photography is a full service wedding photography business serving Northern New Jersey and also a full service family photographer serving Northern New Jersey as well as offering wedding photography services throughout the New Jersey area and also family photography services throughout the New Jersey area who is very much passionate about wedding photography and family photography." well...that would be pretty ridiculous. Google sees stuff like this as "keyword stuffing" and it can end up hurting you in the long run. Just. Don't. Do. It. Content needs to appear on your site naturally and in a way that makes sense. And it's hard. But it works. I'll show you what I mean further down this post! However, due to a LOT of manipulation and spam attempts to link build, Google began cracking down on link building awhile ago. MOZ indicates "In fact, most people would be surprised to learn how many links don't actually help you to rank, or can actually hurt." Best practice is to review Google's guideline to manipulative link building. And the best resource on backlinks that it's out there is Brian Dean from Backlinko. TONS of amazing and useful tools regarding SEO and backlinks. In the simplest description possible for general creative small business owners...having links to your site on busy or high traffic websites will HELP you a lot when it comes to SEO. Don't go crazy with it, don't be a spammer, just know that having a quality link to your site on a busy website will help you in the long run. HOW DO I OPTIMIZE FOR SEO ON SQUARESPACE? Here are NINE ways to get your Squarespace website optimized for SEO. Keep in mind, doing all of these things is in many ways similar to making sure your car gets a tune up and oil change every three thousand miles. You are paying attention to making sure it runs well, but if you take your eyes off the road for long periods of time you will likely crash and burn. Simply doing these things won't make you instantly return on page one for all of your desired search terms, but it WILL help you get to that point quicker. **Quick sidenote...there is a video at the bottom of this post that goes over a lot of this information LIVE. So if you are like to watch things instead of read them, head down to the bottom and check that out! It is imperative to have your site title and SEO description updated in the backend of your website. The how and the what behind naming images in Squarespace. This can be a somewhat controversial topic amongst SEO pros, but I like to keep it to the basics: describe to Google what the image is all about. So you need to name your image in a way that Google understand what the image is and HOW it relates to what your blog post is all about. The relation is important!! Don’t go stuffing words into images in blog posts that don’t relate to the blog post. That is a no-no and will end up hurting you in the end. It’s super easy to name your images in Squarespace. It works a little bit differently for image blocks than galleries, and while I’ve seen some different strategies for going about it, I simply update the filename on individual images when inserting an image box and my images will still show in google results. 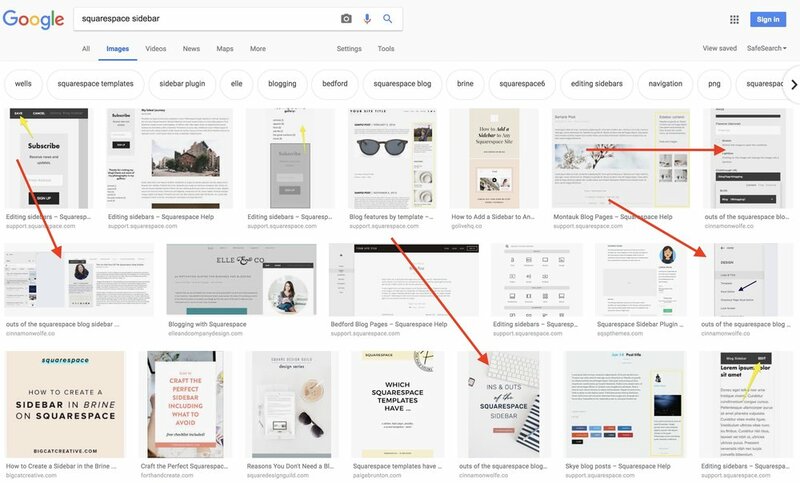 Here are result when you type in Squarespace Sidebar…images from my blog post show in the top three rows of image results. If you are inserting a gallery of images into your blog post or on a page, you can also update the description of the image but it's not quite as intuitive. Insert your gallery, go to DESIGN, click OFF show title and description and then on each image in the gallery click the gear icon and enter the filename of the photo. Here is a brief video showing you how to do this. *** Please note it is no longer advised that you put the same alt text on every image in a blog post. This video is from a few years ago and is meant to show you HOW to update gallery file names. This is not really specific to Squarespace per se, but it is pretty much the backbone to all things SEO. Your site can't be "optimized" if you don't know what it's being optimized FOR. For what search term do I want to show up on page 1 or 2 of results? Thinking carefully and strategically regarding keywords and phrases can be the make or break when it comes to your site showing up in results. ***Suggestion-> Google a keyword or phrase that you think would be a good fit and then check out the bottom of the page to see some other similar search terms that are suggested. In addition to AdWords Keyword Planner (which is free if you sign up for a Google AdWords account) you can find decent relative search terms that might not be so highly sought after. >>>>> For a more in depth look into researching keywords for your site check out THIS POST by Marksmen Studio. It’s so helpful!! There are a few different places to update your location in your Squarespace site and having your location updated will obviously help if you are looking to pull up in search results for local business. Also in each blog post you write you have the option to update the location. Open the blog post, click settings and then you will see the options in the upper right hand corner. Select Location and update. You can update descriptions on every single page you create within Squarespace. Adding keywords or keyword phrases to the page or a description of content that is on the page will add to content on your site and help crawlers identify what your website is about and what type of info it contains. 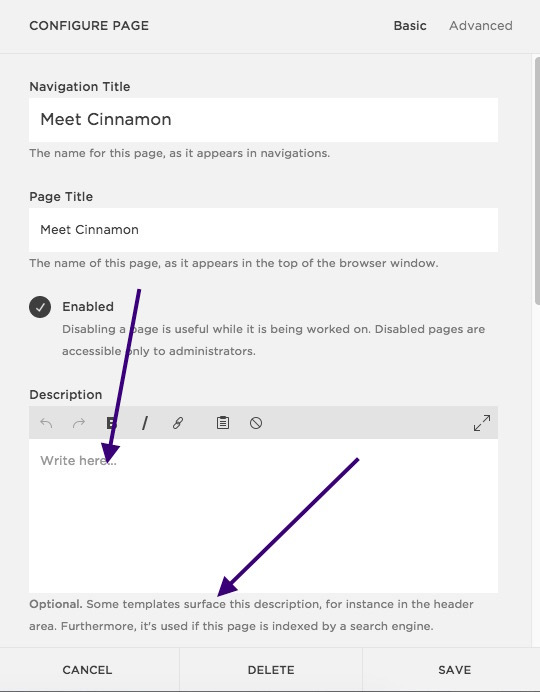 ***Some Squarespace templates will surface page descriptions in strange ways which might affect the aesthetic of your page or site. So do some testing to make sure your descriptions aren't affecting the aesthetics of your site. This is especially important when blogging or using text blocks. Don't just write paragraphs and paragraphs of content without any separation or headings used. First of all, how many times do you come across a GIANT blob of text on a website and think to yourself "Oh boy! I can't wait to read through all of that!!" No. That doesn't happen. Admit it. Using headers within your content is a GREAT idea for multiple reasons. It's more pleasing to the eye and makes more sense to the brain when reading. Search engines give headings a higher priority. Sooooo...if your headings contain some good quality keyword or keyword phrases...bada boom bada bing. You're in the business of SEO. Getting your work featured on other sites is a great way to build external links. Guest blogging can also be a great idea. As long as the relationship "makes sense" and is not an obvious scheme in order to get your links on a crazy number of other sites, Google prioritizes websites who have credibility. Getting your work or your link on a site that has massive amounts of traffic and is a legitimate, helpful website will do nothing but help your rankings in the long run. In addition to just being a total drag to your website visitors...image load speed also can affect your page rankings. No one likes going to a website and sitting there and waiting for the images to load up on to the page. It's a huge turnoff and can absolutely cause people to click out of your site right away. Make this a priority!! Load optimized images that are small in file size but will show appropriately on your web site. Squarespace does a LOT for you in this department and you can find out more about that HERE. But in general, 1500 pixels on the long edge is optimal. PPI in this case doesn't matter for web viewing and if you have disabled right click on your site then visitors won't be able to right click/download images off your site. They can still screenshot, but any screenshot is going to be low resolution anyway and unsuitable for printing. In April of 2015 Google expanded its use of mobile friendliness as a ranking signal. According to Google, mobile friendly will have a SIGNIFICANT impact on search results. Another plus of Squarespace? All templates are mobile friendly off the bat. Winning! If you are not on Squarespace, you can check if your site is mobile friendly at the link above and if it's not....make it a priority to make sure that it is! More info on some of the above included in a Squarespace Help article on increasing your sites visibility in search engines is HERE. HOW DO I KNOW HOW I RANK? The seemingly obvious answer would be to simply google your desired keyword and see what happens right? Well of course it can't be that easy silly! The thing is, google keeps a record of your website and search activity and that affects what pulls up for you. Often times you spend a lot of time looking at your website from your own browser, pulling up content to share with others or with clients and constantly accessing the backend of your site. All of that activity can skew results when you search for something on the browser you consistently use. To make matters even worse...google has different servers all over the world that will also potentially pull info slightly different. So someone searching for "blog sidebar" in California might get different results from someone in South Carolina searching the same thing. Not all hope is lost though! The easiest way to get a decently clear understanding of where you are in search results is to use an incognito tab within Google Chrome. Using an incognito tab will not factor in your own browsing history or behaviors so you will have a much more accurate view of how you place. If you want to show up on page 1 or 2 when someone searches "Austin Wedding Photographer" you can use an incognito tab and type that in and then just click through the pages until you see your site. PLEASE note however that using incognito tabs is also not a TRUE measure of exactly how you rank in search results. Because of Google's aim to personalize search results, browser history still may come into play. A lot of industry people use 3rd party software and even that isn't perfect. It's a moving target and hard to nail down, but incognito will help you more than just your regular normal everyday browser. WILL I LOSE MY RANK IF I SWITCH TO SQUARESPACE? You guys ask the best questions! This would be a valid concern and question for anyone currently using another website host or provider, especially if you already have some decent ranking results for your desired keywords. The answer is, as it usually is, it depends. There will be some work involved, but you can absolutely take some definite actions during the switch that will help you not loose any of your current rankings in search results. My intention is not to totally recreate the wheel and Squarespace already has a fantastic how to article on all of the above which you can access HERE. This is a really good question and I am glad you asked. Trust me, I was contemplating this post for a while mostly because even though I felt like I had a really good handle on the subject...people get paid big money to "do SEO" for companies. Who am I to talk about this subject like I have any idea how it all works? I don't have a direct answer to that, but what I DO have are results. When I was living in Ridgecrest and first started really paying attention to SEO I started to make some changes on my website to see what would happen. Literally within about a month and a half I started seeing my page on page 1 of search results. Granted, "Ridgecrest photographer" may not be as heavily searched as say "NYC photographer" but still, with little time and effort I was able to start seeing actual results from what I was doing. Take a second and go and google "Ridgecrest photographer". I should still be on page 1. Then click on "images"...my images will still be all over that page. When I moved to New Jersey I knew that returning on page one of "NJ Wedding Photographer" would be really tough, so I focused my efforts on a little bit more specific keyword search "northern NJ wedding photographer" and after only 6 months of living there and not a ton of shoots or weddings I made it to page THREE of search results for that term. I also realized that I returned on page ONE of Mount Olive NJ Photographer and I wasn't even trying for that! Simply because of the information included in my footer and my other good SEO practices enabled me to return well for a term I wasn't even paying attention too. After I moved my business over to focusing on private photo editing, I made that the goal to rank for. And as of now, if you google the term “private photo editor” I should return for sure on page one and possibly in the top spot depending on your location! In addition to these client based terms, I consistently return on page one or two of searches including terms like "squarespace sidebar", "blogging on squarespace", "Blogstomp and lightroom" and a few others. All of the above is absolute confirmation that the practices I have put in place are providing desired results! Looking for even MORE awesome info about how to make sense of google rankings? Check out this article! Here is a video walking through most of what I discussed in this post. Please keep in mind, this video is a few years old so the website etc…is pretty outdated. Are you a photog using Squarespace? Grab my FREE guide!